The battle for the town and harbour at Pornichet began in earnest today when Republican forces commanded by General Henri de Bouzille (Paul) attacked the Emigre, English and Chouan army (Me) deployed to defend their toehold on the French mainland. Paul wanted to be the Republican commander, and immediately saw the immensity of the task ahead of him. Had it not been for the presence and whispered threats of Citizen Maldatette from the Committee of Public Safety he would not have attacked until further reinforcements had arrived. The Republican Levee battalions were all classed as Newly Raised and Untested so their stamina was unknown until they were first shot at when it would be decided by the roll of a dice, and the first time they shot or fought in melee another test would determine if they would panic or be made of sterner stuff! Two of my Emigre battalions had the same characteristics. Chouan troops line the hedgerows. The Emigre brigade. The Damas Fusiliers in the foreground with the Bachman regiment supported by the Salm-Kirkberg horse artillery manning the defences. In the town are the Mirabeaux Legion. General the Comte d'Hervilley the Emigre commander in the foreground. To his right are the Loyal Emigrants together with their battalion gun. 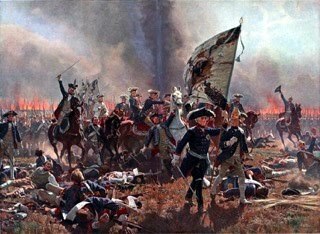 In turn 1 Paul threw low and his entire brigade of newly raised troops went pell mell right at the Chouans lining the hedgerow. Even six battalions of not very good Republicans must surely see off some revolting peasants? The Republican horse artillery deployed to try and batter the coaching inn into submission. ...while the foot battery deployed to engage the English troops in the centre, but without much success. On the other flank things were a little less organised and the Republicans were struggling against a mixture or poor command rolls and dogged Emigre resistance. Finally the Republicans created a gap and forced their way over the road, forcing several Chouan units to flee or withdraw. Meanwhile the grenadier battalion crossed the river and deployed into line. The Republican troops surged (again!) across the road towards the second line of Chouan troops and the remains of the first. Savage fighting broke out among the vineyards and olive groves. The grenadiers assaulted the coaching inn. It was to take several turns before they were able to eject the Chouan defenders after a second battalion sneakily attacked the inn from the rear. Paul's left flank attacked the Emigre troops lining the hedges but were unable to make a breakthrough, taking heavy casualties in the process. However a lucky shot felled the Emigre commander the Duc de Choisil, who was carried from the field unconscious. The Chouans charged Paul's infantry as they broke through the hedges and drove them off leaving a big gap in the Republican line. 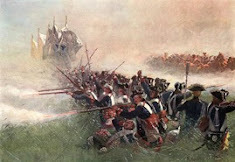 The Chouan in turn were routed by another Republican battalion. 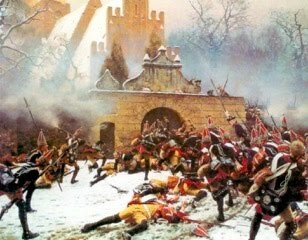 Meanwhile the French dragoons had finally got to move and charged a unit of Chouan behind the church, destroying them in no short order despite taking severe casualties. I made the Chouan take an amended 'form square' test even though they wouldn't have known how to do so, to see if they fled (failed) or stood disordered (passed). A double 6 would have seen them form a huddle. Back near the town, the Republican attack has crumbled. General Trecon has been killed, shot from his horse while rallying a battalion of infantry. 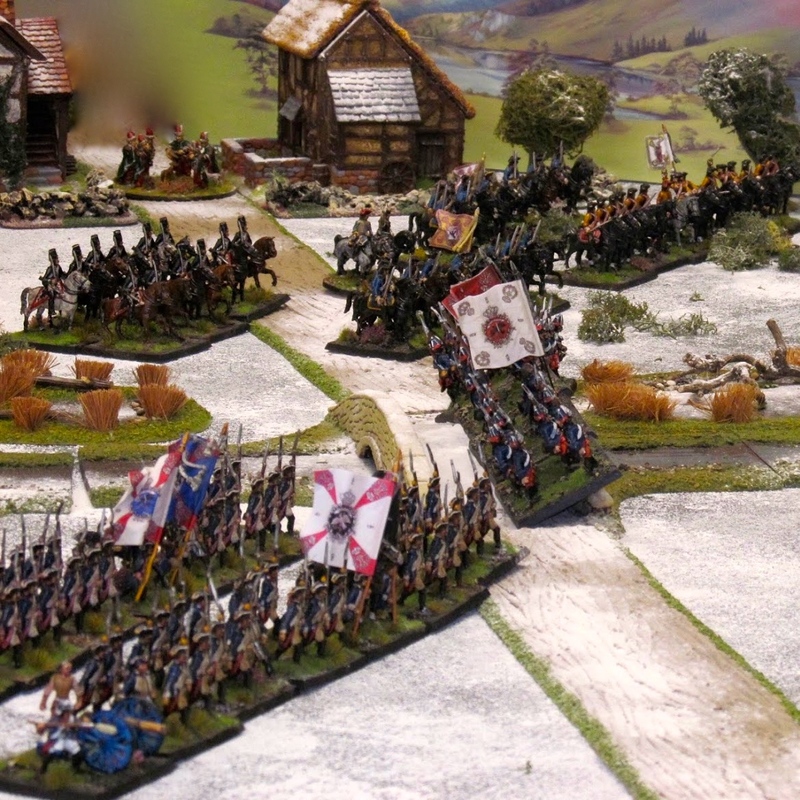 The Republicans seen above were unable to beat the artillery in melee so dismal was their dice rolling, allowing the English combined grenadier flank company battalion to hit them in the flank, forcing them to retreat shaken and disordered. One unit of Republican chasseurs a cheval made an attempt to exploit a gap in the allied centre. Sadly the other English flank battalion was able to quickly plug the gap and give them an ineffective volley which at least stopped the cavalry in their tracks. Flanked by sheep the Republican artillery finally decided to manhandle towards the enemy. Had they done so sooner then based on previous experience it would have been a bad day for whichever unit they decided to target. As it was it was too late. Back at the church the Republicans were locked in combat with its defenders but were unable to make any headway. The Chouan garrison of the church. The coaching inn has fallen but in the background the Republican attack can be seen to be faltering. Citizen Maldatette of the Committee of Public Safety dictates notes to his secretary Citizen Chatterance. In the dying minutes of the action the Emigre chasseurs continue to harass the Republican flank. General Bouzille orders his battered forces to withdraw. Sailors manning ships cannon in the coastal battery while the Royal Artisans continue building gabions and fanciness to augment the defences. The task of unloading supplies continues while victorious soldiers enjoy a beer or three. 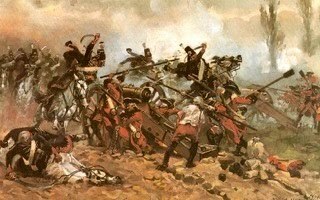 The best Emigre regiment, the Royal Emigrants, had been held in reserve throughout the battle and had not fired a shot in anger. The Loyal Emigrants' battalion gun. 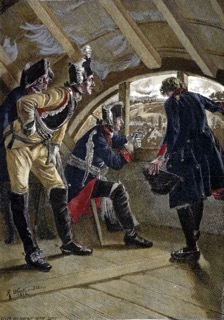 The Chouan commanders hailing victory after the battle. Sadly, most of their troops had been badly mauled or even fled the battlefield, possibly never to return. He then confronts the Republican commander General Bouzille and threatens to have him removed and sent to Paris for trial on charges of treason. However, he relents and under pressure to win a victory gives him a second chance. But no more failures will be tolerated! Well, was it too hard a nut for the Republicans to crack? I don't think so but hindsight is a wonderful tool. The Republican artillery was used far too conservatively, and a more aggressive approach would have caused serious damage to the defenders. Apart from that, they just ran out of steam, despite crushing the Chouan and capturing the coaching inn. They weren't helped by some dreadful dice rolls from Paul, and some excellent and timely ones from me. The Republicans will retreat to reform and lick their wounds, while there is a chance that some nearby towns and villages will rise in rebellion against the hated Republic! What happens next? You will have to wait and see. Oh, and the Comte de Choisel is only lightly wounded with a severe concussion after falling from his horse, so he may be back in the saddle soon. What a cracking game and wonderful to look at. A perfect tonic for my frayed nerves after one of those days at work! Really looking forward to the next game in the campaign. Last game at the frontier outpost planned for 21Feb but might squeeze another solo one in as well as there is a small action to fight that takes place in the following campaign turn to the west. Thanks Matt. Am I right in thinking you live ‘over the hill’ from me? Wonderful looking game and troops Colin. Lovely to see so many revolutionary figures on the table.